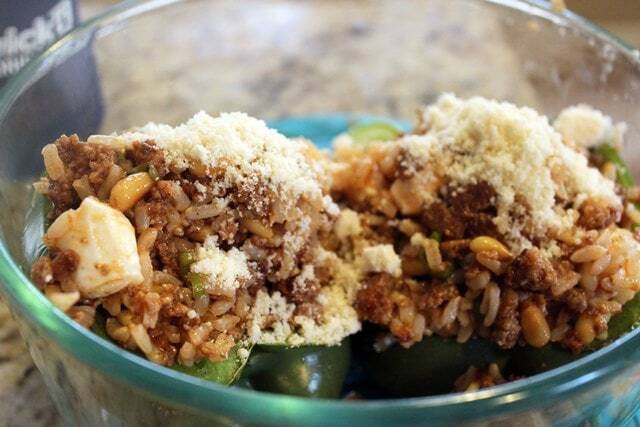 BUT, I remembered that my mom used to make an Italian version of stuffed peppers that I LOVED when I was little. Garlic/cheese/tomatoes really can make most things better, so these babies were born. I hope you like them! You’ll also need marinara, any kind you like, and 1/2 cup brown rice. Easy stuff! 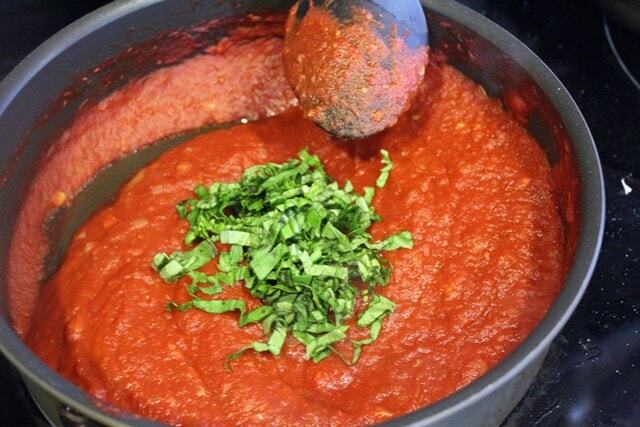 Click here to see how I make my marinara. 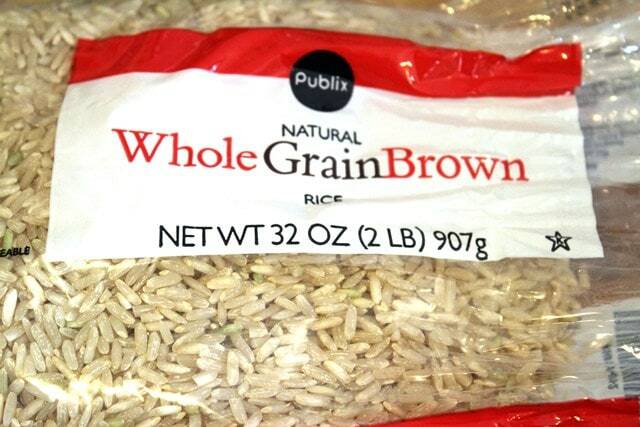 First, cook the brown rice in water to the package directions – you can do this way ahead of time! Then, preheat the oven to 400F and grab the bell pepper. Halve it, and scoop out the seeds and ribs. Place the halves face up in a baking dish. 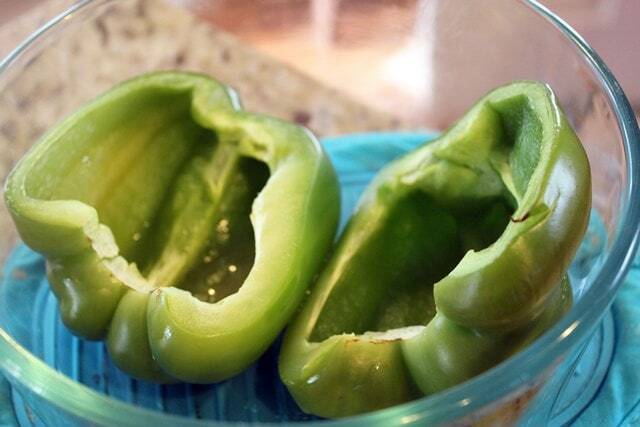 Bake the green pepper for 10 minutes just to start the softening process. Set a timer. When it’s done, it’ll look like this! Leave the oven on if you’re going to eat the peppers right away. If not, you can make the peppers all the way to the end (when you put the parmesan on top of the filling), then just bake them whenever. 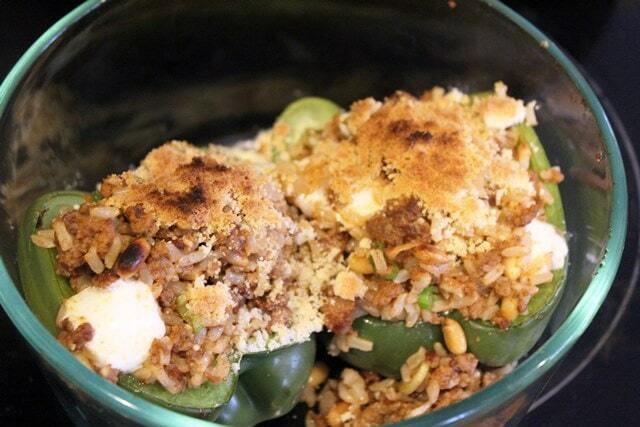 While the green pepper and rice are working, toast the pine nuts, if they aren’t already toasted. 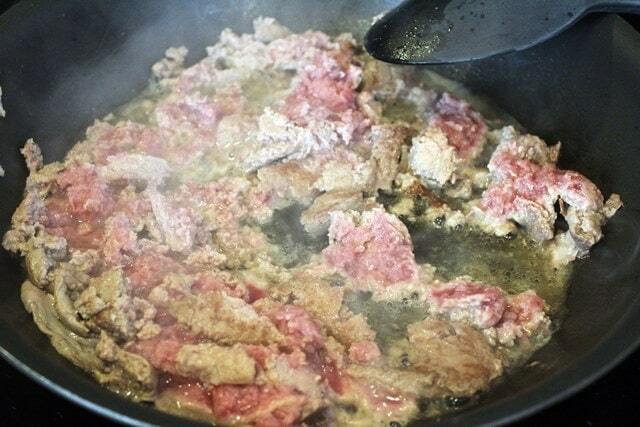 You can do this in the same skillet you use to make the meat mixture. Heat the pan to medium heat with the pine nuts. Toss them around for 2 minutes or so until they’re slightly golden and you can smell them. Remove them to a bowl, and there you go! 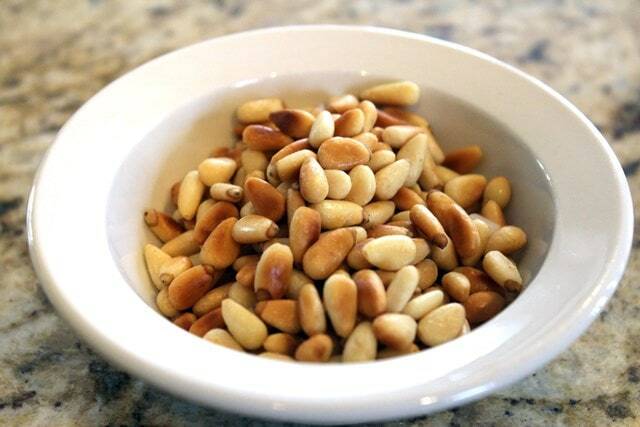 Toasted pine nuts. Now, increase the heat in the skillet to medium-high and add the turkey with a drizzle of olive oil. Mine was in burger form, which was why I wanted to get rid of it. 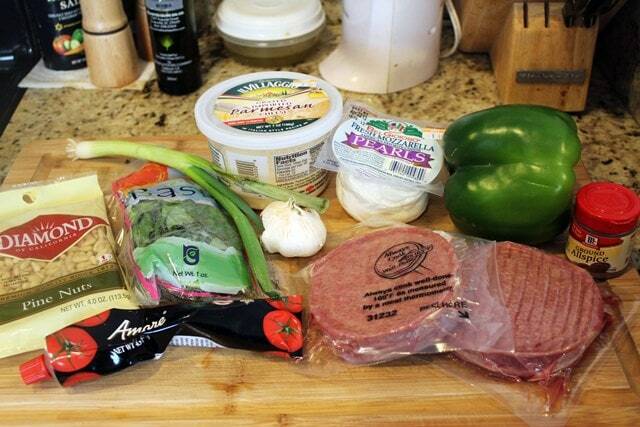 I got a good deal on these burgers, but they were kind of grody, so I wanted to use the meat without forcing a burger situation. Use a spoon to break up the meat as it browns. 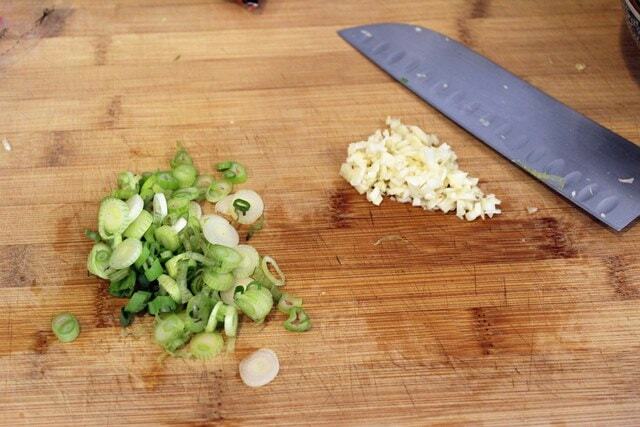 While that’s happening, mince the garlic and thinly slice the scallion. 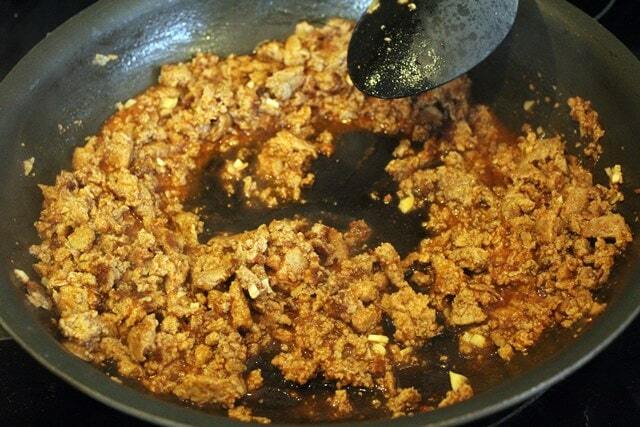 When the meat is browned, add the garlic, tomato paste, and allspice with a sprinkle of salt to the meat. Stir together, and add some water if your meat is dry – mine was nice and lean, so I added 3 tablespoons of water to make a tiny bit of sauce. Let the garlic and spices cook for 2 minutes, then turn the heat off. Now, at this point my rice wasn’t done because I used brown rice and it takes 40 minutes to cook, which I ALWAYS forget about, so I let the meat cool slightly on the stove while I wandered around the house aimlessly drinking wine. It happens sometimes. 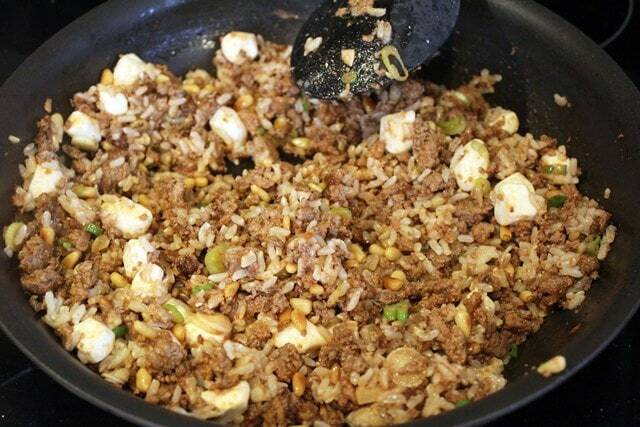 When you get your act together and all your ingredients are prepped, add the rice, cheese, pine nuts, and scallion to the meat mixture. Stir this, and taste. It’s GOOD. 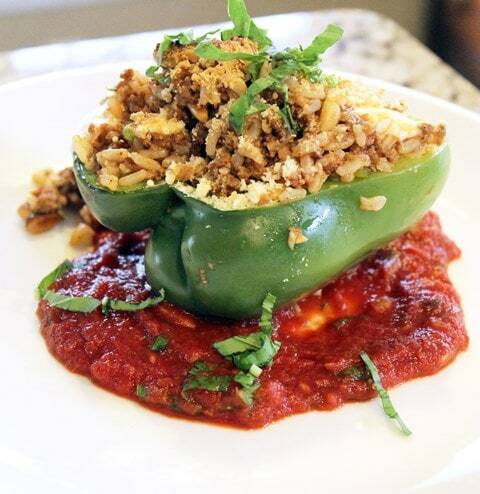 Like…forget the peppers good. Add more salt if you’d like! 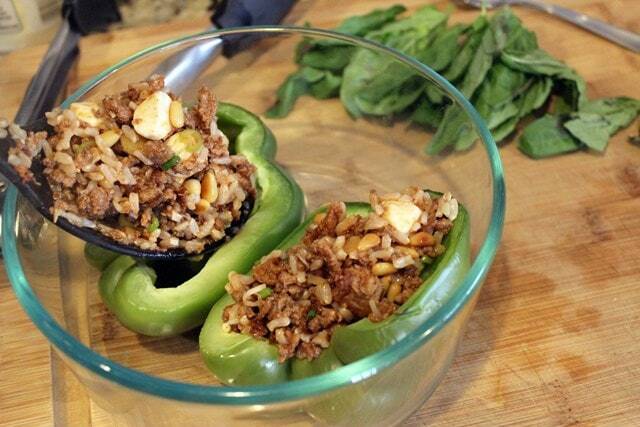 Heap the filling into the peppers – save the rest for leftovers! 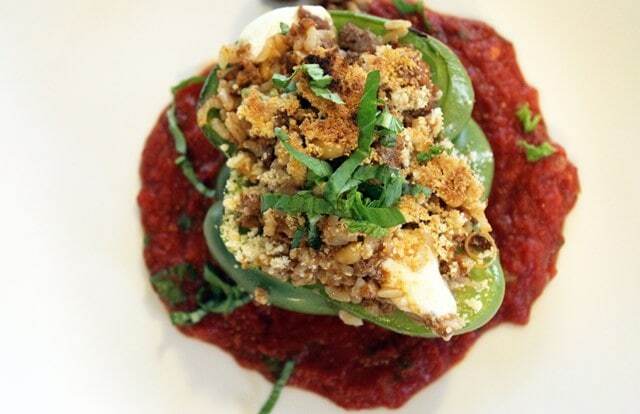 Top the peppers with the parmesan cheese – 1 tablespoon or so for each pepper. 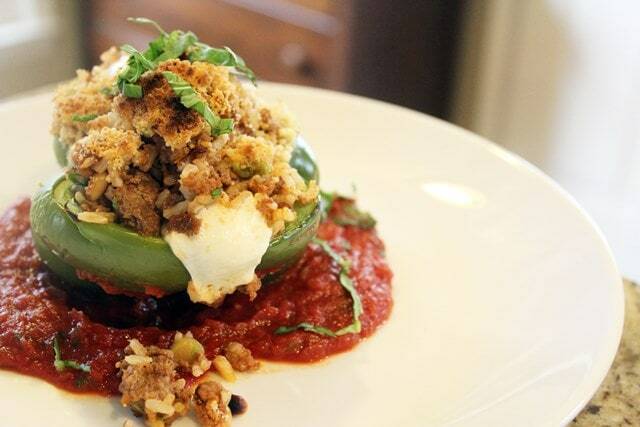 While the peppers are doing their final baking, grab the basil. Mine looked like sh*t because it’s April. Sorry. I wanted it anyway. 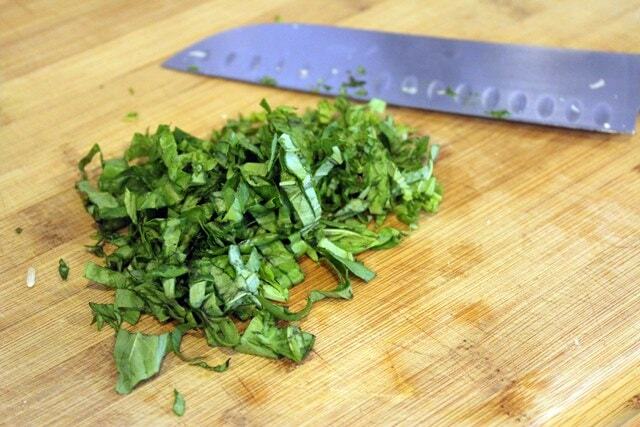 Thinly slice or tear the basil, then put HALF of it in the marinara – whatever kind you’re using. Stir together, and save the rest. Bake the peppers for 10 – 15 minutes in the still-headed 400F until the parmesan topping is brown and crispy and the filling is melty and hot. That’s it! I think it’s so pretty to serve this with marinara on a plate, then a pepper, then basil. You could of course spoon the marinara on top if that’s more your thing. I added some crushed red pepper to mine too because…I like crushed red pepper on top of my Italian food. It’s a thing. Enjoy this guys! It’s a great use for random bits of ground meat, and I PROMISE there was no grody freezer flavor in this at all. You’ll love these! Preheat the oven to 400F. Halve the pepper and remove the seeds, stems, and ribs. 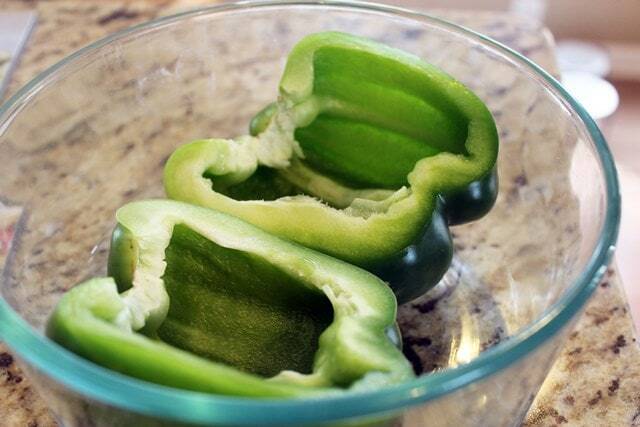 Place the pepper cut side up in a baking dish and bake for 10 minutes to soften slightly. Meanwhile, make the meat filling. Heat a large skillet to medium heat with a spritz or drizzle of olive oil. Add the turkey, and brown for 7 or so minutes until nearly completely cooked through, using a spoon to crumble it. 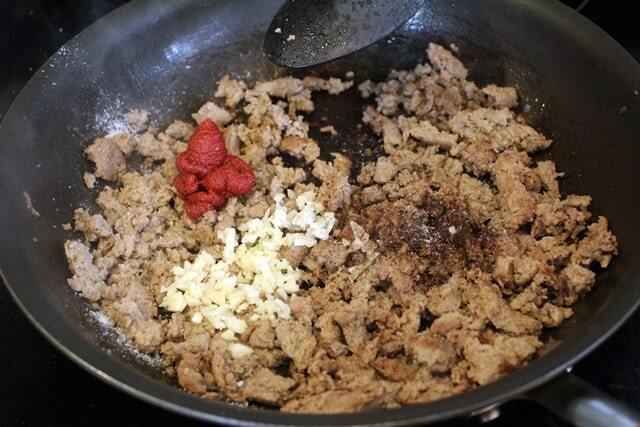 Add the tomato paste, garlic, and allspice with a sprinkle of salt to the meat mixture. 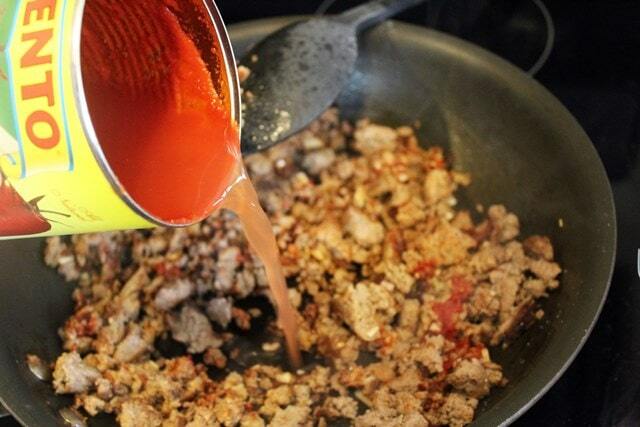 Stir, and add 1 - 3 tablespoons of water to form a light sauce if your meat is very dry. Turn off the stove and let the mixture cool slightly. 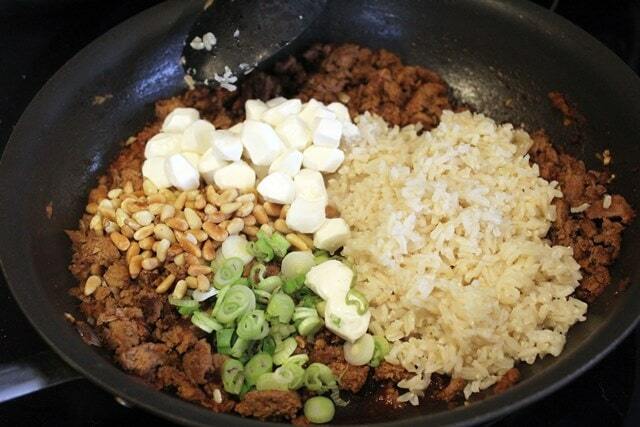 Add the rice, scallion, pine nuts, and cheese to the meat mixture. Stir to combine and taste - add more salt to your preference. Heap the filling into the slightly cooked peppers. Top with the parmesan cheese. Return to the oven and bake for 10 - 15 minutes until cheese is melted and topping is browned. 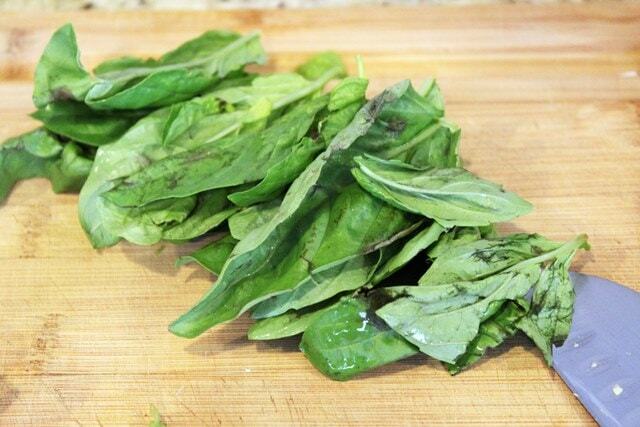 While the peppers are baking, tear or thinly slice the basil. Stir half the basil into prepared warmed marinara. To serve, spoon some marinara on a plate. Top with a pepper half, and top THAT with more fresh basil. Enjoy! You can make this entire dish right up until the last baking - keep them covered in the fridge and then bake whenever you'd like to eat them! Previous Post: « So, How’d He Propose?